Water Content Of Sourdough- Is Wetter Really Better? I have a confession to make: I first attempted to take up sourdough baking around five or six years ago, but gave up after several weeks because of frustration. I couldn’t decide whether I was just a rubbish baker, or whether all the hype around sourdough was a case of everyone admiring the Emperor’s new clothes. Self-taught, using online resources such as The Fresh Loaf, I found my breads lacked structure, and resembled vulcanised rubber when being chewed. The dough was extremely difficult to handle, and refused to accept shaping into anything other than a flat ovoid. It’s hard to enjoy baking when the process becomes a bit of an ordeal, and the result is unspectacular. When my starter developed a mould infestation after several days of neglect, I felt almost relieved to allow it to succumb. So what happened along the way to allow me become so enthused by this awkward art? The penny dropped for me one day while baking a loaf of plain white yeasted bread. I became distracted while making the dough and accidentally added far more water to the mix than I was supposed to. I didn’t realise my mistake until after the loaf was baked. I was aware during kneading that the dough was strangely difficult to handle, with a propensity to stick to everything. Not only that, but it collapsed when I turned it out of the banneton after its final proof. Perplexed, I baked the loaf anyway and removed a flat, chewy bread from the oven half an hour later. Once I realised where I had gone wrong in my preparation, it dawned on me that the bread in many ways reminded me of my sourdough experiences- could I have been adding too much water to my doughs? Time to get a starter going again to find out…. Several weeks and many bakes later, I had the confidence in myself to realise I could produce the sort of results I aspired to using far lower hydration rates than those recommended in most of the recipes I was attempting to follow. This is part of what inspired me to begin blogging on the subject; to help people realise that sourdough baking is done by touch and feel as much as by following recipes and protocols. While your dough should be sticky, it should still be pleasant to handle and should be able to take on and hold the shape of your proofing container, except in certain very wet breads such as ciabatta. There are several factors that affect a dough’s water-retaining ability, but chief among these is the protein content of your flour. Not only the absolute content, but also the composition of the protein. Flour protein comes in two main forms, glutenin and gliadin, which combine to form gluten during dough development. It is this gluten which is responsible for binding water; maximising the bound water in the dough will result in a well-risen loaf with great texture and an open crumb, but overloading the dough with water will make it heavy and weak, and produce an excessively tough bread. While higher protein levels in flour would be expected to allow greater water absorption, the composition of the protein is determined by the DNA of the wheat used in its production, and so two different species of wheat with identical protein percentages may have quite different water -binding capacities. It appears that flours produced in the USA and Australia for instance have much higher water absorptive capacities than those produced in the UK and Western Europe, and this is where I had been struggling in my intial sourdough attempts, as most online resources are curated in the USA. From experience, and following conversations with bakers far more accomplished than I, it is clear that sourdough bakers in the UK and Ireland should probably expect to reduce their dough hydration by around 5-10% in order to achieve results comparable to those they are seeing either online, or in books such as ‘Tartine’ or ‘Bread’, which are written from a primarily American perspective. If you are following any of my recipes, the reverse is true; an Australian baker is likely to find my doughs to be dry and inelastic, and will want to increase the percentage water. There is a well-worn mantra in sourdough that ‘wetter is better’, and while the professionals may attempt to drum this dogma into the rest of us, it is my humble opinion that this only holds true up to a point. Get to know your flour, stick with a brand long enough to become comfortable with your own abilities before becoming too catholic in your choice of ingredients, and if a recipe doesn’t work for you then change it. I would like to thank Andy Munarriz, World Bread Award Winner 2014, for helping me pull some of this knowledge together. Thanks also to Marriages Flour for their willingness to answer questions from the ‘bread nerds’. So happy to read this! I’ve been withholding 20-30g of water for almost every recipe and still berated myself for not allowing for a higher hydration. I’m not nuts, this is a wonderful day! Cheers! Absolutely. 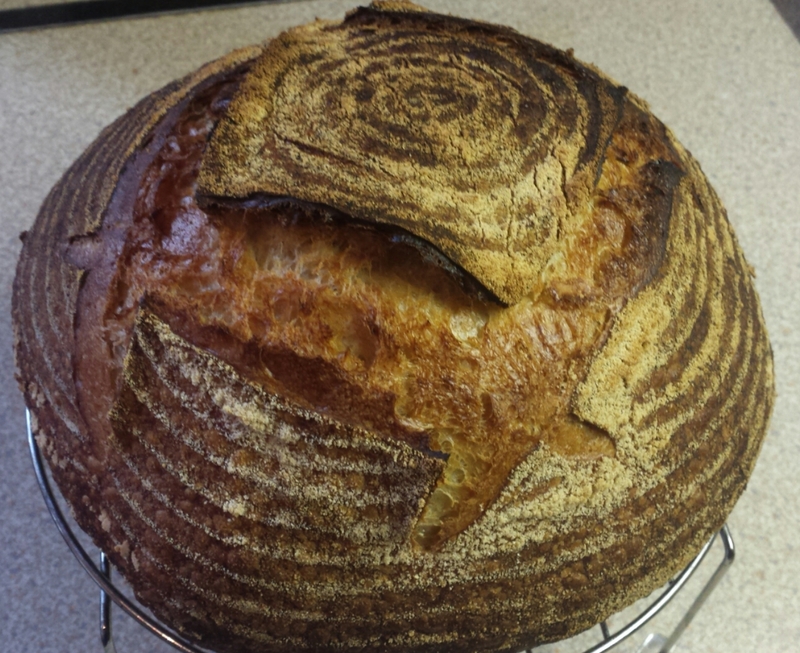 Especially when you learn on your own and compare your bread against a glossy shot – took me over a year to feel confident to handle sourdough and it was only when I cut down on the recommended water quantity that I started getting better results. Phew, this is a relief! Thanks for the research! I reckon a lot of those loaves are Photoshopped 😉 You’re very welcome, thanks as always for reading! Perhaps the single most sensible sourdough blog entry ever. After years of dismal failure, my baking was revolutionised by a day with Vanessa Kimbell and the purchase of a La Cloche. I don’t think in percentages, but I guess 600 ml of water to 1kg of flour (Marriages extra-strong Canadian/Stoates strong white mix) is 60%. The dough is a pleasure to handle and the resulting loaf is entirely satisfactory. Thank you very much John, I really appreciate that. There’s definitely an air of machismo in a lot of what you read about sourdough, and there is just no point in pushing for more and more water if it’s not producing the bread you want to eat. If a 60% loaf is good enough for Vanessa, it’s good enough for anyone. Enjoy your baking.